There can be no better gift for me (other than chocolates, of course) than when someone places something in my hands and says, “For sketching…”. These tomatoes are from my sister’s garden — the very first fruits of the vine, no less — lovingly picked, carefully transported and generously gifted. 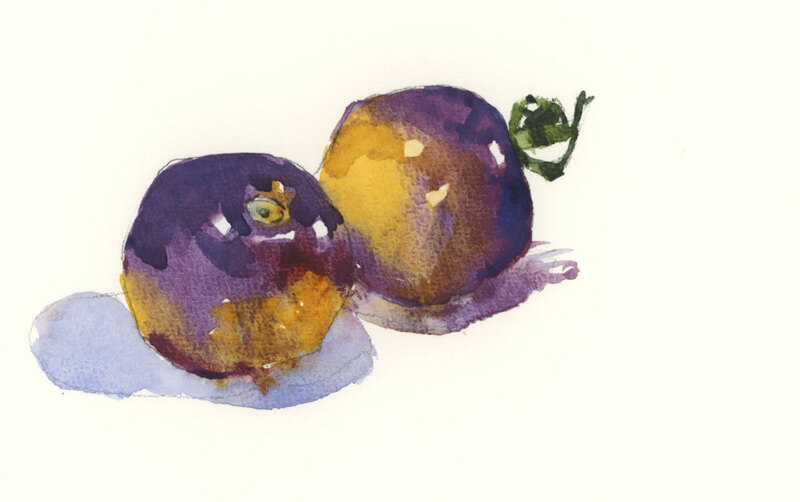 Sketched in a Handbook Travelogue Watercolour Journal, 8″ x 5″, painted mostly with Mineral Violet, Quinacridone Gold and Sap Green. A little blue in the shadows. Thanks Monique. Do you have any purple tomatoes? These were delicious! I put them in my salad last night. If I could eat these colors, I would ! Think I’ll just try using this luscious trio myself. You make any & all small items a possible project fun. Thank Soni. I don’t know about eating the colours but I did eat the tomatoes and they were amazing. Don’t you just love it when someone thinks of you that way. Love your unusual color choice!! I do love that Joan. Thanks! Wow!!! These colors are awesome! Really beautiful!!! I painted tomatoes too yesterday, but used more traditional colors. Thank you for mentioning the colors you used. Glad it was helpful Gabriella.